In here I find myself expressed in different realms/ where stringent terms and conditions apply/ so I fly not too close to the sun as one with wings of wax! Genius is a trait of betrayal/ if prayer is an act of the loyal. We lace every vowel with a click/ so when we speak the bowels of the earth may relate/ and reverberate in thunder./ Under the rule of devine inspiration/ we find inclination to break out in song/ so long as the jembe beat goes (*singing the hook once*) ON!/ Dawn turns to dusk/ as we unmask every idiom/ as a tedium of devotion / unlocking an ocean of meaning;/ leaning each on the other’s/ understanding/ and finally lending upon the realisation/ that some information/ does not suffer translation with dignity. Humanity contained in every anecdote/ we quote ancestors as yet unborn/ and mourn the death of yesterday’s naievety/ when the liberty of oblivion departs from our souls’ minds/ and winds the hands of time/ with each line- each verse-/ to reverse the flow of intellectual traffic/ from spiritual topics. Dropping bombs of rhetoric,/ we obliterate the nucleus of the mind of the beast’s seventh head./ Dead or alive, misconception’s our target/ as we budget for a fair price/ and entice ice into admitting it’s just frozen water. Jah’s chosen order/ knows no borders in times of truth;/ tooth decay/ the price we pay for chewing through candy-coated wood/ disguised as food for thought./ Not bulimic yet we expel false mythologies/ that retell past trilogies from the first person perspective/ of the collective while regurgitating/ and imitating the gospel of sanctimonious foreign idols/ armed with bibles whose dogma rivals the mysteries/ of our collective histories as a people of infinite worth/ who consummate birth through songs of praise/ and raise our spears up high/ when the tears we cry for our fallen warriors/ cannot carry us beyond our grief/ to relief/ as we accuse time of being a thief with no shame! Name our children for the values we deem most precious in our searches for perfection/ under the protection of this or that holy diety/ whose piety grants us these lessons/ and blessings. Persons of royal decent,/ we’ve spent light years chasing the moon/ at noon. Night fears the sun/ so we connect one -by- one/ fact-by-fact/ and in effect eclipse/ with our lips those words which imprison/ our powers of reason,/ teasing the sky into a change of season. Peas in a pod,/ God and I converse/ and confess our dreams/ till it seems we share the same pillow./ Willow trees and I relate when the wind blows through my hair/ to soothe my head through these harsh rays of light as I fight and sometimes fail/ through these pale images in my head/ like a mad creature. I’ve bled; sutured my flesh/ only to catch myself/ about to scratch afresh just after time heals all wounds. Tunes and melodies/ are remedies received as grace/ from the same place where we were conceived/ before our need/-no, make that our greed-/ for material sensation/ outdid self- realisation and forced us/ to devorce/ the source and travel to this plane. We remain connected to the Milk Way/ and many say/ we play bigger than our minds/ when signs of our divinity surface/ despite the burning/ furnace of yearning/ turning us into addicts/ of conflicts with fate. Cos we are/ spectacular/ in every vernacular/ blood thicker than Count Dracula could ever sip! We trip on heart-lines/ and art finds the voice to declare:/ “NGIMUHLE!”/ Yeah,/ clear as crystal/ my sister, our spirits/ will it so a new day is near. Oh let’s wear our faith on our sleeve/ and believe every morning/ is worth atoning for the sins/ our skins have not yet committed! The docket was saved in my psyche,/ I’m lucky it was neatly folded/ and has not been eroded/ so I can now claim I WROTE IT! Ningobani bakwa bani abazalwa ngoban’. Dejavu Tafari has been involved in the performing arts since her high school days. Having discovered her abilities as a writer at an early age, she has honed her skills in creative writing and used them as a means of social commentary, making a name for herself in the slam poetry scene as a writer and performer of note. 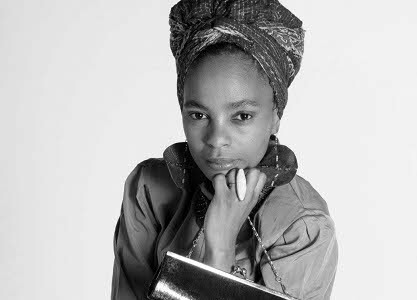 Having completed a Live Performance course at Cape Town’s A.M.A.C in 2004 and gone on to further her studies in Theatre Performance at UCT, her work fuses elements of physical theatre, contemporary live performance, music and story-telling to deliver impactful social commentary on issues such as spirituality, cultural heritage, child abuse, peer pressure, love and various other issues which affect the youth. She currently co- owns NTUTOPIA PRODUCTIONS- a township-based production company and uses this platform to generate theatre and television productions which focus on telling stories that empower the black youth demographic by reinforcing positive values. She has gained popularity within the Slam Poetry scene as a result of her consistent performances at events such as UNCUT (Cape Tech); AFRO (UCT); Kopano (Langa); All N.YZ (Guguletu); GOEMARATTI (Cape Town) and various other youth- orientated initiatives around the Western Cape. She has recently collaborated with an acoustic ensemble called the Umthwakazi Band; adding indigenous Xhosa music to her witty lyrics to create a kaleidoscope of experimental word-sound-power that has been well received by her widening audience base. Other performances include the Speak The Mind Poetry Extravaganza (Artscape Theatre Sept. 2009); Poetry on Long (New Space Theatre Jan. 2010); Verses (Feb. 2010); Badilisha Poetry’s 100 000 Poets for Change( 2011) and Woman To Woman( 2012). Dejavu is currently working on her debut album.